These have a hopper made with stainless steel, coated steel or tough plastic above the spread­ing mechanism driven either by the power take-off or a hydraulic motor. Trailed broad­casters have a hopper capacity of 5 tonnes or more but most broadcasters are mounted and, depending on model, have a hopper capacity between 1.5 and 4 tonnes. However, the size of the fertiliser hopper will be limited by the lift capacity of the tractor hydraulic system. Hopper size can be increased on some machines by adding one or more extension kits. One such machine with a standard 3.3 tonne hopper can, with a bolt-on extension kit, have its capacity increased to 4.1 tonnes. Most broadcasters have a screen in the hopper to prevent lumps of fertiliser or any stray material from clogging the outlet point above the disc(s). An agitator in the bottom of the hopper prevents the fertiliser bridging, especially when working in a damp atmosphere, but this mechanism is not required for broadcasters where the spinning disc(s) forms part of the hopper bottom. Plate 12.13 A mounted single disc spinning broadcaster with a spreading width of 10-15 m.
Plate 12.12 The hopper on this twin disc broadcaster with an extension kit holds approximately 1,000 litres, which is about 1,900 kg (38 cwt) of fertiliser. Spinning disc broadcasters have either one or two horizontal, stainless steel discs which receive fertiliser from the hopper. Stainless steel or plastic spoons or vanes on the discs spread the fertiliser evenly over the ground. The power take-off should run at 540 rpm. As broadcasters have a low power requirement, fuel economy can be achieved when using a tractor with a two-speed power shaft in the 1,000 rpm setting so that the power shaft runs at 540 rpm at a lower engine speed. The drive, which is protected by a slip clutch, is arranged on twin-disc machines so that the discs contra-rotate with both discs either rotating towards or away from the centre of the machine. The discs are timed with each other to give the best possible spread pattern and to prevent fertiliser colliding as it leaves the discs. Application rateis changed by regulating the flow of fertiliser from the hopper to the disc(s) and by changing gear to increase or decrease the forward speed of the tractor. An adjustable shutter controlled by a hand lever or small hydraulic ram controls flow of fertiliser from the hopper. 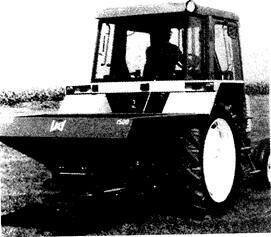 The range of application rates varies with different models of spreader. A typical machine will spread between 3 and 1000 kg/ha. Spreading widthcan vary from 8 to 48 m depending on the type of fertiliser being spread, the size and type of machine and the way it has been set. The variable factors which affect the spreading width of spinner broadcasters include the type and position of the of vane on the spin­ning discs and on some machines discs with a different spread pattern are used to vary the width of spread. Altering the drop-off point of the fertiliser on to the disc is another method of changing spreading width, and the height of the disc above the ground also affects spread pattern. When applying fertiliser to cereal crops with tramlines the width of spreading must match the spacing of the tramlines. Some broadcasters have hydraulically driven spinning discs with an electronic speed control which provides an infinitely variable disc speed, allowing the broadcaster to operate at different spreading widths without changing the discs. The width of spread is also affected by the type of fertiliser. Granules, prills and powdered fertilisers vary in size, weight, density and hard­ness, and each of these factors determines how far a particular fertiliser can be spread. Material with a high weight per litre will be thrown further than one with a low litre weight. A typical twin-disc machine has spreading widths ranging from 16 m with light fertilisers up to 24 m with heavier and denser products. Accurate distribution of fertiliser is important to achieve high yields and prevent striping in the crop. A fertiliser spreader can be tested for uniform performance by driving over a set of collecting trays while spreading normally in both directions to give the correct overlap of fertiliser between two bouts. The fertiliser in the trays is collected and measured in a series of tubes, or weighed, and the results of the test, in the form of a column graph, illustrate the accuracy of spread across two bout widths. The columns should be level across the width of the graph. A 10 per cent variation in column height across the graph is acceptable but if the variation is more than 15 per cent then ferti­liser quality and spreader settings should be checked. Variations over 20 per cent will cause striping in the crop, reduced quality and lower yields. Environmental regulations include certain restric­tions concerning the application of fertiliser on field boundaries, especially near watercourses, footpaths, wildlife margins and housing. Con­trolling the pattern of border spreading will also maximise crop yields on headlands and reduce the waste of fertiliser on land outside cultivated areas. Various border-spreading control systems are used on spinning disc broadcasters. Tilting the hopper sideways with a small hydraulic ram sets the disc at an angle to the ground and reduces the width of spread on one side of the machine. Border spreading on some twin-disc machines is controlled by closing one of the hopper outlet shutters. With a deflector plate between the discs, fertiliser will only be spread from one side of the machine. The spinning discs on some broadcasters have adjustable blades, which can be set to reduce the spreading width on one side of the machine. Border spreading can also be controlled in the cab with an electric actuator. One design has two blades on the spinning disc for full-width spreading and a single short border blade. For border spreading the actuator directs fertiliser from the hopper to the border blade and at the end of the pass the actuator restores the flow of material back to the full-width blades. An alternative system for border and side spread­ing where the first tramline is near the field boundary uses a set of metal deflector fins raised and lowered hydraulically from the cab. When lowered, the fins change the direction of the fertiliser as it leaves the spinning disc to reduce the width of spread on the boundary side of the machine. Monitoring systems.The high price of fertilisers has resulted in the introduction of electronic monitoring systems for checking the accuracy of spinner broadcaster spread patterns. An uneven application rate is usually because the spread pattern is either too wide or too narrow. The likely result will be striping in the crop and reduced yields. One type of monitor has two sensors that measure the flight of the fertiliser granules as they leave the spreading discs. This information is displayed on a screen in the tractor cab and if the data does not conform with the correct setting to give required width of spread, the driver can correct the fault by adjusting the spreading mechanism. Another type of monitoring system has a camera that constantly monitors the flight of the granules as they leave the spreading discs. The information is fed to the in-cab computer and if the spreading pattern is incorrect the computer automatically adjusts the spreading mechanism. 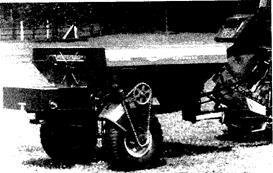 Plate 12.14 A trailed 3 tonne fertiliser spreader with a wheel driven floor conveyor and hydraulic motor drive for the spinning disc. Plate 12.15 The floor conveyor and twin spinning discs are driven by hydraulic motors on this lime and fertiliser spreader.